We've regularly covered flexible e-paper display technology here at GeekTech, mostly as demos that never amount to a real product. But now, LG has announced that it has begun to mass-produce its first-ever flexible plastic e-ink display, which should arrive in Europe by the beginning of next month. LG’s latest flexible e-paper display measures six inches diagonally, and has a 1024 by 768-pixel resolution. Unlike a typical e-reader, the display is made of plastic and it does not need a thick and heavy sheet of glass to protect it. According to LG, the plastic screen will bring the total weight of the device to 14 grams and 0.7 millimeters of thickness. LG claims its reader is one third slimmer and half as heavy as other commercial glassed e-paper screens. Even though the screen is made of plastic, LG says that it is super durable and can bend at an angle up to 40 degrees. Furthermore, LG says it has done extensive stress-testing on the display with a 1.5-meter drop test and by bashing it with a small urethane hammer that resulted with no scratches or breakage. Still, it remains to be seen if it could withstand our Tim Moynihan. 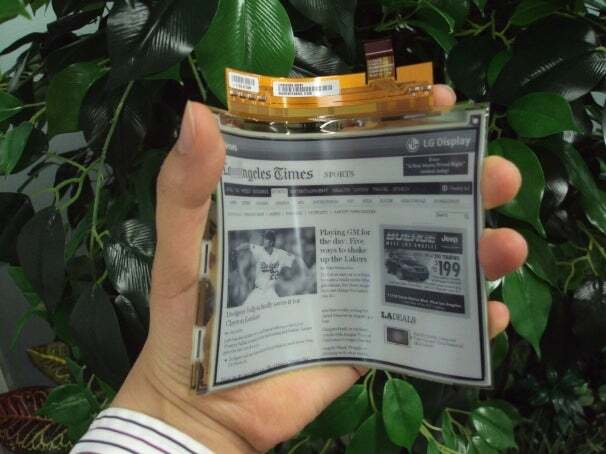 This is not the first time we have heard of a promising flexible e-paper device from LG. Two years ago, LG presented a 19-inch e-paper display that was big as a newspaper. Unlike that display, though, this one is actually being produced. The flexible plastic e-paper displays will first be supplied to device manufacturers in China, and they should appear in completed products in Europe by the beginning of next month. There’s no word when the screen will make it into US products, but hopefully it will be soon.